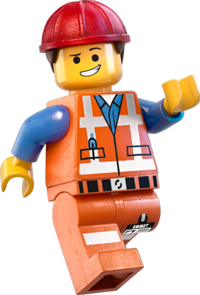 If your son or daughter enjoyed The LEGO Movie, chances are that your little “Special” got hooked by the bouncy theme song and has been singing it ever since. While Emmet Brickowski may think they’re awesome, playparty.net doesn’t recommend rocks, trees or frogs as party favors. Looking for something LEGO-ish that kids will appreciate? Here are some cool ideas. 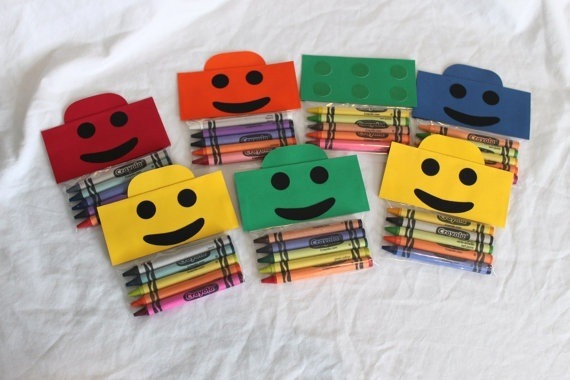 Be creative — unleash your inner “Master Builder”. Start with these cute gift bags by Tricia. Buy brightly colored bags and matching card stock. Use a circle cutter or scissors to make eight half-dollar size circles for each bag. Attach the circles to the bag with pop dots or double-sided tape. 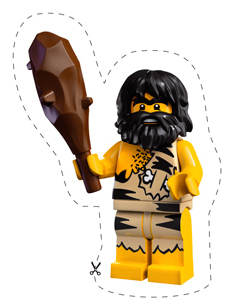 The LEGO Shop offers a wide selection of free downloadable mini-figure stickers. Just print, cut and package. The mini-figures are adorable and your guests will love the stickers. Buy LEGO elements in bulk, then create an individualized assortment for each guest. LEGO Basic Bricks Deluxe has 650 bricks in white, orange, red, blue, yellow, brown, black, dark green and light green. 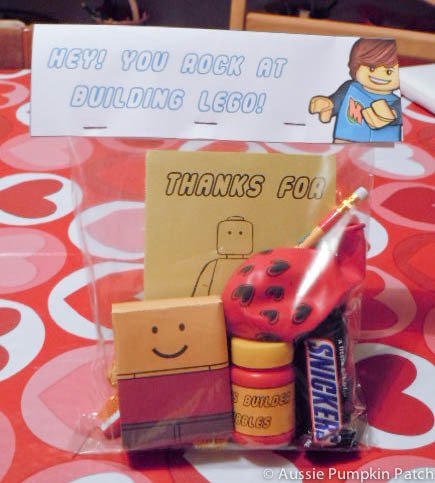 The LEGO Creative Bucket contains more than 600 elements including wheels, and decorated face and eye bricks. Each set costs about $30; “Kragle” not included. Plastic food storage bags are perfect for holding party favors. Fill bags with LEGO stickers, LEGO bricks, crayons or notepads. Dress them up byfolding card stock over the top of the bag and stapling it shut. 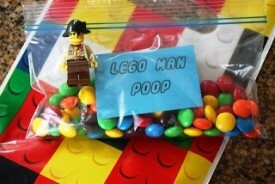 Carolyn of Silly Happy Sweetputs colorful M&M’s into snack-size bags and labels them “LEGO Man Poop”. And every parent knows that kids are wild about bathroom humor. Kendra shares a free printable LEGO Party Pack on Aussie Pumpkin Patch. The Pack includes raisin box wrappers, bubbles labels, and a coloring book that guests will enjoy long after the birthday party has ended. 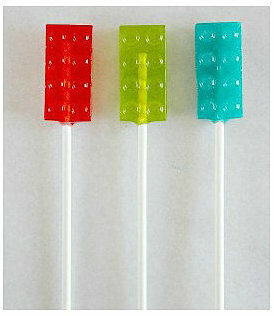 Tonya offers a tutorial on making LEGO lollipops with Jolly Rancher candy and a LEGO bricks ice cube tray. 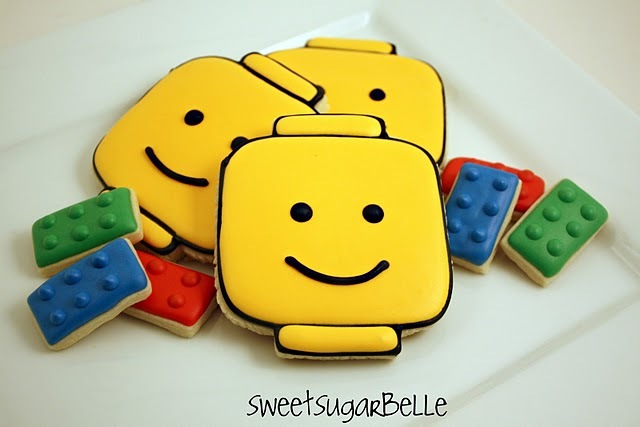 And now, the “Piece of Resistance”… If you like to bake and decorate sugar cookies, then you’ll love this LEGO Man Cookie template by Sweet Sugar Belle. 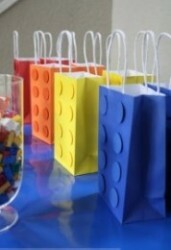 And of course, for the main event entertainment, book your LEGO birthday party with Playparty.net now!